Whether you’re new to cigars or even a seasoned veteran, you’ll quickly need to begin properly storing your collection. No matter how few you own, it’s essential that cigars are stored properly to protect them from the elements. If you don’t store your cigars properly, they can end up drying and losing their flavour. However, cigar storage and humidors aren’t really common knowledge. In fact, there’s plenty of conflicting advice out there. Therefore, we’ve made sure to offer you the best resource on the internet. You’ll find a more exhaustive menu below with all our guides. Not only will help you discover the best humidors that you can buy according to collection size and budget but how to use them and ensure that they work properly. Read Our Latest Cigar Reviews! When you go to a proper tobacconist, you’ll notice that all the cigars are stored in glass cabinets, boxes and even dedicated rooms. Each of these should be different types of humidors. In short, a humidor is a humidity-controlled environment that is used for storing cigars. It ensures that the level of moisture is consistent within the entire space to make sure that the cigars are properly stored. Tobacco is extremely sensitive to humidity and an excess or lack or humidity can be detrimental to tobacco and can cause them significant damage. Most typical environments are too dry cigars, which will cause them to become dry. When too dry, cigars will become hard, brittle and will even lose their oils and aromas. Conversely, cigars may develop mould or an outbreak of beetles that will eat them when in an environment that’s too humid. As such, humidors are designed to provide an airtight seal to prevent humidity from escaping or entering the container. Meanwhile, a humidity device is used to release or absorb moisture to ensure that the relative humidity is at the desired level. This level should be around 70% relative humidity with an ambiant temperature of approximately 21°C (70°F). If you want to learn more about the best levels and temperatures, a full cigar storage humidity guide is coming soon. Furthermore, some humidors such as coolers are designed to regulate the temperature too. While often overlooked by some collectors, the temperature can have a profound effect on the cigar’s preservation. Overall, humidors are designed to achieve the same goals but can come in a variety of shapes and sizes. In this guide, we’ll briefly talk about the variety of humidors available. While wood is by far the most popular and common choice, humidors can be made from all sorts of materials. These can range from different types of synthetic and metal containers with their own advantages and drawbacks. Ornate and decorative in appearance, humidors are often the preferred choice for their luxurious elegance. Although the exterior can be any type of wood, the interior is typically made from Spanish cedar. However, cheaper humidor may feature an American red cedar or Honduran mahogany interior. Nevertheless, Spanish cedar is the preferred wood for its natural moisture-absorbing and beetle repellent properties. As attractive as they are, wooden humidors require more upkeep than other materials. For instance, a new wooden humidor will require seasoning before it can store cigars. You can learn more about wooden humidors with our detailed guide. A material that’s growing in popularity, acrylic is much more convenient than wood for several reasons. Firstly, some people like the transparency so they can consult or admire their collection without opening the humidor. However, the most advantageous characteristic is that acrylic humidors don’t require seasoning. Therefore, you just need to throw your cigars in with your desired humidity devices. Read up on this type with our guide to acrylic humidors. Although rare today, there was a time when it was popular to store cigars in glass jars. Yet, this has largely fallen out of fashion as it’s not particularly good for the cigars. If exposed to sunlight, glass humidors may experience a greenhouse effect and the contents will heat up. This is bad for the cigars and so they’re best kept out of the light. However, wooden humidors with glass tops are popular for the same reasons as acrylic humidors. This allows the owner to consult any hygrometer readings or the size of his collection without having to open the lid. Nevertheless, we’re not overly fond of most glass-top humidors. You’ll rarely see us recommend any as the seal between the wood and the glass tends not to be air-tight and is often a source of moisture loss. Still, converted wine fridges or “wineadors” are often made from metal and glass but feature a better seal to prevent this. Our full wineador guide offers more information if you want to learn about their benefits. A much rarer materials for humidors, marble containers are not unheard of. Only slightly porous and naturally cool, they do offer an interesting environment for storing cigars. However, they’re quite heavy and very expensive so it is indeed rare today. As we hinted earlier, humidors can greatly vary in size. From small cases to walk-in rooms, they each achieve the same objective but for a different volume of cigars. Most retailers and some serious collectors will have dedicated walk-in humidors, which are effectively entire humidity-controlled rooms. Meanwhile, occasional smokers will be perfectly content with a small desktop humidor, which contains around 30 cigars. Designed for convenience, travel humidors are portable cases that carry as little as a few cigars to around 20, which is just less than a box’s worth. What sets them apart from other types of humidors is that they’re made with lightweight and robust materials. As such, they’ll resist being crushed inside your luggage and are light enough to carry around in your hand. Usually made from resin, the feature a rubber seal and clasps to prevent both moisture from escaping and accidentally being opened. Furthermore, they’ll often be lined with foam to stop cigars from getting damaged inside. Learn more about them with our dedicated guide to travel humidors. Probably the most common type, desktop humidors are larger cases that are placed on furniture such as a desk or table. Nevertheless, they can still greatly vary in size with some that store as few as twenty cigars while others can contain well over one hundred. Typically, desktop humidors are designed to be quite decorative and are made out of wood. After all, they’re not just practical but also ornamental. However, they can also be made from acrylic or even glass. Desktop humidors usually open at the top like a chest but may have the odd tray underneath for accessories or extra cigars. If you want to learn more about this time of humidor, we you’ll find our recommendations in our guide to desktop humidors. However, you can also discover all the medium-sized humidors that we explore too. Much larger than desktop humidors, some cabinets can still be placed on existing furniture. However, most are freestanding and can range from the size of a mini-fridge to a large bookshelf. As you may guess, cigar cabinets tend to be for more serious collectors who don’t have the need or space for a dedicated walk-in humidor. While smaller cabinets can store anything from two hundred cigars, some are so large that they can contain thousands. 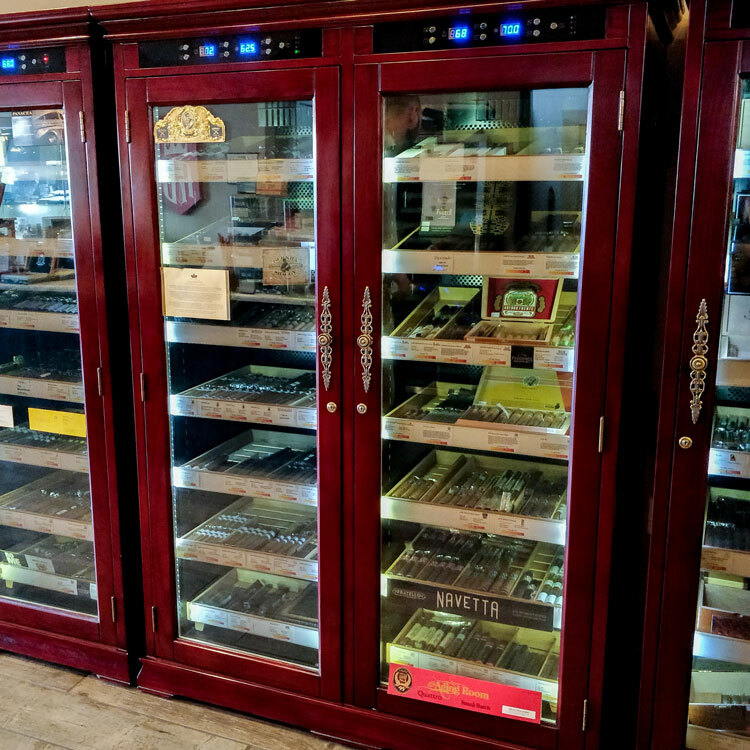 Furthermore, many modern cigar cabinets are equipped with temperature regulation like a refrigerator. Meanwhile, antique ones are effectively cabinets that have been modified for storing cigars. You can learn more about these with our guide to cigar cabinets. Otherwise, discover other storage options with our guide to large humidors. Entire rooms dedicated to cigar storage, a walk-in humidor requires serious investment and upkeep to both install and maintain. Most cigar shops will have a walk-in humidor, which may be no larger than a broom cupboard for storing excess stock. However, a walk-in humidor can technically be any size. Unlike other storage solutions, walk-in humidors require precision-calibrated ventilation systems and air conditioning to maintain the temperature. This ensures that the humidity is distributed equally throughout the entire room. If poorly ventilated, humidity may get too high in our area while the air dries out entirely in another. A telltale sign of poor ventilation is patches of condensation on any windows of surfaces. While a humidor or similar container is the fundamental requirement for storing cigars, there’s actually a little bit of work required for preparing and maintaining the internal humidity. You can’t just throw your cigars in a humidor and hope for the best. As mentioned above, a humidor is essentially a micro-climate and this needs to be prepared beforehand. We briefly mentioned the importance of seasoning a wooden humidor. Overlooking this fundamental step can potentially cost you your entire collection. However, this is only a requirement for wooden humidors or wooden components. Seasoning basically prepares the wood by humidifying it before the cigars are added. Like you skin after a shave, the new wood will be quite dry and it requires hydrating. Wood is essentially a membrane and will absorb or release moisture depending on its environment. Adding cigars into an unseasoned humidor causes the wood to absorb the moisture released inside. Unfortunately, this won’t be just the humidity device but your cigars too. Therefore, it will dry them out by literally sucking the moisture from them. Seasoning ensures that the wood has absorbed enough moisture beforehand so that the wood becomes an ideal environment for your cigars. So don’t overlook this step and learn how to season a wooden humidor with our full guide! In order to ensure that your cigars are in the best environment possible, it’s important to regularly check on their humidity level. This is achieved by using a hygrometer that gives a reading of the relative humidity. With an accurate hygrometer, you’ll know whether the humidity is too high or too low. As such, you’ll be able to take the right course of action if this happens. However, an often overlooked practice is calibrating a hygrometer. While some hygrometers are fairly accurate when coming from the factory, it might be slightly off. We’ve seen some uncalibrated hygrometers that are as much as 10% off! The consequences of this means that you might be over or under-humidifying your cigars without knowing it. Fortunately, calibrating a hygrometer is easy and takes as little as 24 hours. Once you’ve achieved this, you can be confident that your device is providing an accurate reading. A series of resources on how to calibrate hygrometers as well as the best ones that you can buy online is coming soon! 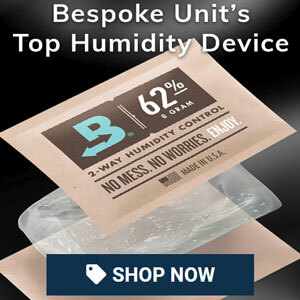 Finally, you’ll need a humification system that adds the necessary moisture to your humidor. These can vary in size and shape just as much as the humidors themselves with both primitive and elaborate options available. Each have their benefits and drawbacks but it’s always best practice to invest in a quality system. Both overkill and carelessness can ruin your cigars so proper research and appropriate system is wise. 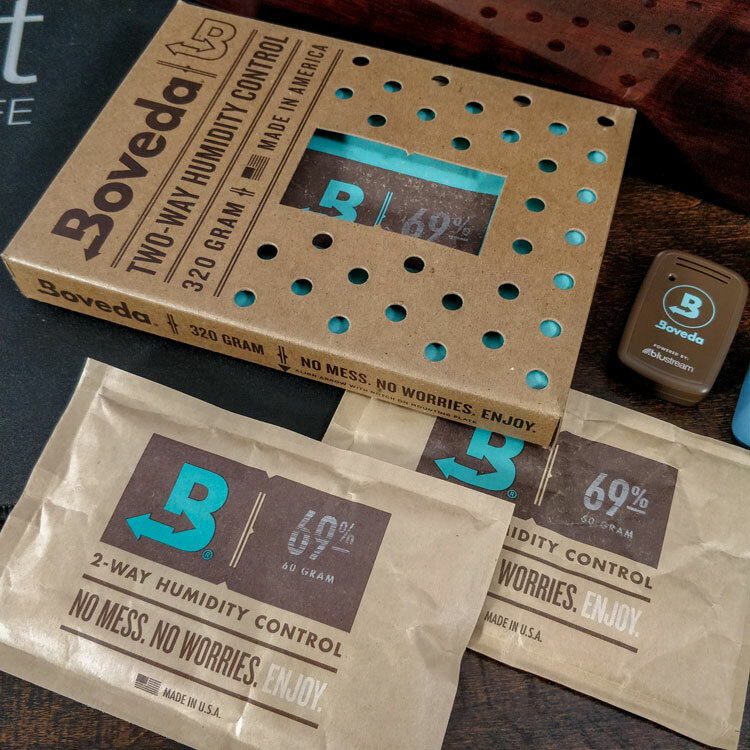 Overall, we prefer products that offer a two-way humidification process such as Boveda’s humidity packs. 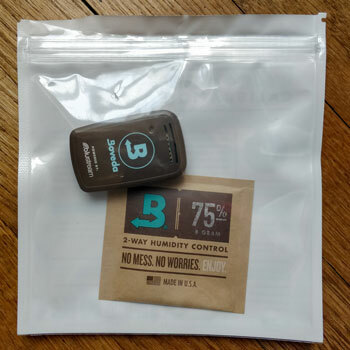 Unlike sponges and most gels that just continually discharge humidity, they release moisture only when the relative humidity gets too low but actually absorb it when the humidity gets too high. You can learn all about humidification such as the best devices and how to use them with our upcoming series of cigar humidity guides. Reviewed by Tyrone P., on 10th October . "An excellent primer! 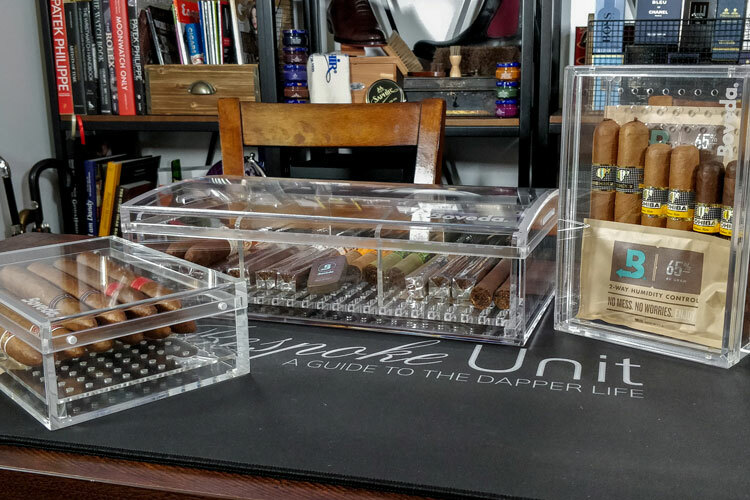 I'm new to cigars and humidors and needed a really solid introduction to storing my new collection."